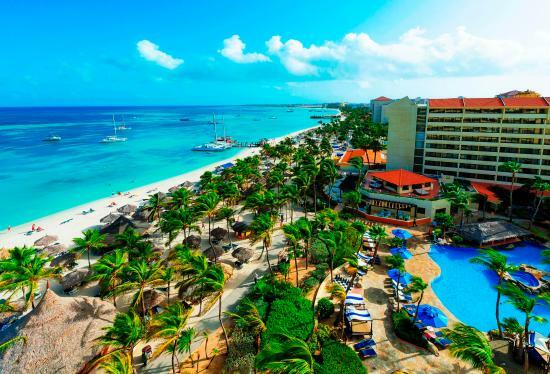 Transports its guests to a unique beachfront experience in Palm Beach, on the Caribbean island of Aruba. It stands out for its spectacular sports and leisure activities available to guests that are closely linked to the delightful beach where the hotel stands. This resort provides the opportunity to enjoy maximum relaxation, whether that be a refreshing dip in its spectacular swimming pool or sunbathing in the stunning gardens. It also offers exciting sporting activities, with tennis courts, supervised activities and a variety of water sports on the beach, such as snorkeling, diving and beach volleyball. Free Wi-Fi in the lobbyAll guests will have free access to the internet in the hotel lobby for 60 minutes. ​The 373 rooms in the resort are large and comfortable, with an elegant balance between modern colors and classic furniture, creating a very welcoming environment. They are fully equipped and all feature a balcony or terrace with outdoor furniture. Check-in time: from 16.00 hrs.Check-out time: before 12.00 hrs. The above prices are for the all inclusive hotel accommodations and round trip shared transfers . We are happy to assist you with air travel.. If you need help, with airfare, please note your preferred airport when filling out the form. It is best that all hotel reservations are made through this agency to insure your inclusion in all group activities. We price match, so please let us know if the price is a concern. Pricing is not guaranteed, and will fluctuate. We will send you an updated quote and wait for your approval before charging your credit card. The deposit required for room only is $50pp the deposit varies for a land/air package. Please fill out one form for the entire room (not per per person) You will have the option to either accept or decline travel insurance. The cancel for any reason insurance policy is $99 pp and will cover land only. The price for a land/ air package is$129.99 pp. See below for full policy details. After submitting the registration form, you will receive a separate link for payment. Multiple payments will be accepted per room. Please RSVP and reserve your room with your $50 per person refundable deposit.